The city of Kanchanaburi is a microcosm of what makes Thailand such a fascinating country. You'll find a blend of historical sightseeing opportunities, as well as lush tropical wilderness areas, where you can appreciate the unique natural beauty of the Land of Smiles. Kanchanaburi was once the site of Neolithic civilizations, evidenced by artifacts of ancient societies and burial sites that have been excavated here. In the mid-20th century, the city became notorious as the home of the Bridge on the River Kwai, the controversial structure built to support the Thai-Burmese railway by prisoners of war during WWII. Nature lovers will also find plenty of things to do. Several national parks lie in the surrounding area, with opportunities to see stunning waterfalls; impressive cave systems; and a diversity of wildlife, including wild gibbons, monkeys, and birds. Located only a two- to three-hour drive from the big-city attractions of Bangkok, Kanchanaburi is easily accessible via bus or train. Called the "Bridge on the River Kwai" because of the famous movie of the same name, the Death Railway Bridge is the best-known historical landmark in Kanchanaburi. It was erected through the forced labor of British, Dutch, and American prisoners of war during WWII. The bridge was part of the Thai-Burmese "Death Railway," so named because of the scores of men who died during its construction. Japanese forces oversaw the project, as the railway would have helped bring supplies to their troops who were fighting the British in neighboring Burma. Today, you can walk or ride a train across this bridge, sections of which are from the original structure. Market stalls surround the area selling food and souvenirs. The well-curated exhibits of the Thailand-Burma Railway Centre provide an excellent overview of the railway's history and the brutal conditions suffered by the POWs and forced labourers who built it. Poignant personal accounts, photographs, artifacts, and videos illuminate this dark slice of history, from the Japanese invasion to the lives of some of the survivors after the war. After absorbing all the museum exhibits, take a short stroll through the well-maintained Kanchanaburi War Cemetery across the street. Also known as Don-Rak War Cemetery, this is the final resting place of nearly 7,000 British, Dutch, and Australian prisoners who died during construction of the Death Railway. Walking past the graves and reading the inscriptions can be an emotional experience, especially when you realize how young some of the prisoners were. Even more sobering is the fact that these graves represent only a small number of the prisoners who died toiling under unimaginably harsh conditions to construct the railway. The Hellfire Pass is a 500-meter-long portion of rock that 1,000 prisoners of war dug out (by hand) to pave the way for the Death Railway. Seven hundred of those men died during the 12-week digging period. Today, it's possible to walk the old railway track into the jungle (which takes about four to five hours), and visit a memorial museum honoring those who died. Established by the Australian government to honor Allied POWS, the museum tells the poignant stories of these men through artifacts, tools, photos, and multimedia displays. The audio headsets are highly recommended. Jungly Erawan National Park offers a soothing counterpoint to some of Kanchanaburi's emotionally charged historical attractions, and the picturesque seven-tiered Erawan Falls are the star attraction. The water cascades down the mountains in a serene setting, surrounded by lush vegetation and limestone mountains. A scenic hiking trail leads up to the top of the falls (look out for thieving monkeys along the way), and the turquoise pools are a lovely spot to take a refreshing swim on a hot day. Dip your feet in the water, and you might feel fish gently nibbling at your toes. Keep an eye out for other wildlife in the national park, including elephants, gibbons, and king cobras. (You'll want to be wary of that last one.) If you're up for a bit of exploration, check out the park's Tham Phra That Cave. You can wander through four cavernous rooms and admire the ancient stalagmites and stalactites. Try to arrive earlier in the day to beat the tour buses. Most people come to Thailand with the hopes of having a divine experience with an elephant, Thailand's most revered creature. Elephant's World provides visitors an opportunity to do that in an ethical way. The elephants here are rescues that have suffered from years of labor and abuse. Rather than riding elephants or watching them perform shows, you spend the day in the service of the animals - preparing food for them and bathing them in the river. It's a way to care for abused elephants and volunteer in a meaningful way. 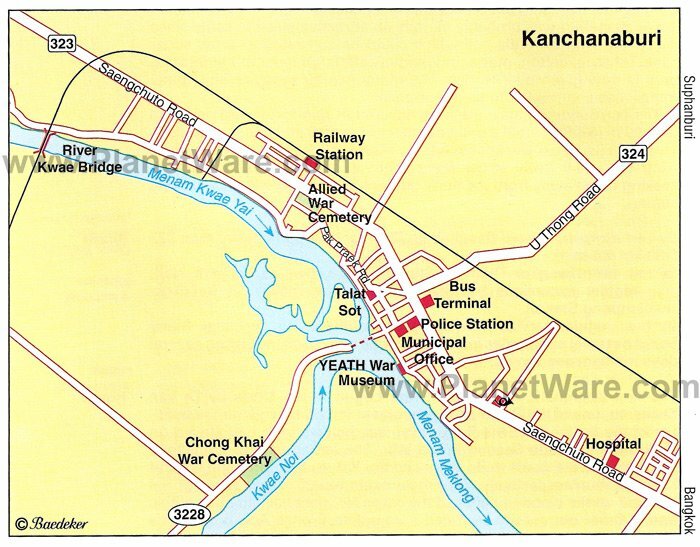 Also called Chonk-Kai Cemetery, this now peaceful area on the banks of the Kwai Noi River is home to the graves of more than 1,700 POWs (1,400 Commonwealth and 300 Dutch casualties), and was also the site of a former POW camp. The ground where these prisoners are buried is the same place they founded a church and cemetery during their years of internment. Many of those laid to rest died at the nearby hospital. Like the Kanchanaburi War Cemetery, this one is also beautifully landscaped. It lies about two kilometers south of the city and is easy to reach from town by bike. Surrounded by lushly-cloaked hills, Srinagarind Dam, along the Khwae Yai River, is the centerpiece of peaceful Khuean Srinagarindra National Park. You'll find less crowds here than nearby Erawan National Park. Within its borders are impressive cave systems with stalagmites and stalactites, and the park is also home to a diverse range of wildlife, including civets, bats, leopards, and slow lorises. While here, be sure to visit the lovely Huay Mae Khamin Waterfalls, which you can reach by boat or 4WD vehicle. The small park near the viewpoint over the dam makes a lovely place for a picnic. This sobering museum was designed as an exact replica of an actual prisoner of war camp. Located on the grounds of Wat Chai Chumphon, the museum is maintained by a monk and allows travelers a look at the harsh realities of life within these camps. The replica includes bunks, photographs, and other authentic items, and the displays include written accounts from actual prisoners of war, their family members, and authors who interviewed POWs. The name of the museum is derived from those countries that were involved in these events: Japan, England, Australia/USA, Thailand, Holland. History buffs will enjoy sifting through some of the diverse artifacts and exhibits at this quirky war museum. In addition to its collection of WWII relics and memorabilia, the museum also provides a more in-depth look at Thai history. You'll find displays related to ancient battles between Thailand and Burma, Thai political history, old Japanese vehicles, helmets, uniforms, photographs, and seemingly incongruous old Khmer-style carved works. Other exhibits recreate the atrocious conditions of the POW camps with life-size figures. The museum also offers great views of the Bridge on the River Kwai. It's worthwhile stopping by this historical park with its ancient ruins, once an outpost built by the Khmers. Despite its original purpose, there's something almost magical about standing in the presence of such an old and elegant structure. Here, you'll find a preserved shrine, tower gates, and ancient inscriptions in the courtyard. It's thought to be one of the satellite cities of Angkor, the capital of the Khmer empire. At the museum on the premises, you can view artifacts and relics discovered at the site. Step back 4,000 years to the Neolithic period and marvel at artifacts from deep into Thai (and human) history at this intriguing museum on the banks of the Kwai Noi River. Founded at the site of a Neolithic burial center discovered by an Allied prisoner of war, Ban Kao National Museum displays the remains of several skeletons, bone jewelry, shell ornaments, tripod pots, axes, and other articles excavated from the area. This is one of the most important prehistoric archaeological sites in the country. This is a waterfall fit for a king. Indeed, King Rama V once visited this site, and it's been praised in Thai songs and poems. The falls are found within the Sai Yok Yai National Park, but are set back three kilometers from the road, so be prepared to do some walking or hop on a motorbike. You can take a dip in the river or skim along it between the towering rock walls. Luxury Hotels: Kanchanaburi has few luxury options, and they lie in tranquil riverfront locations, quite a distance from the main attractions. The colonial-style Dheva Mantra Resort with a spa, spacious rooms, a sprawling pool, and gorgeous gardens, sits about eight kilometers from the Bridge on the River Kwai. Even farther away from the bridge, the boutique X2 River Kwai Resort commands a beautiful location on a bend in the river and flaunts an ultra-modern industrial style. Mid-Range Hotels: In a great location, within walking distance of the Bridge on the River Kwai, Felix River Kwai has spacious, clean rooms in red-roofed buildings that are spread out among palm-studded gardens. You can relax at the two swimming pools and spa. If you prefer to stay in town, close to shops and restaurants, U Inchantree Kanchanaburi is a modern boutique hotel on the banks of the River Kwai, with cozy rooms and friendly staff. Also in town, The Bridge Residence Hotel still lies within walking distance of the bridge and is popular for its large, modern rooms with comfy beds and flat-screen TVs. Budget Hotels: On the banks of the River Kwai, Xanadu 2008 offers good-value air-conditioned cottages and a swimming pool set in well-tended gardens. Another popular budget option is the Good Times Resort, with air-conditioned rooms, a pool, and friendly staff, a 20-minute walk from the Bridge on the River Kwai. Guests love the Thai cooking classes. In a handy location between the city of Kanchanaburi and the bridge, Thai Garden Inn accommodates guests in air-conditioned wooden bungalows. Bangkok: Less than two- to three-hours' drive from Kanchanaburi are all the top tourist attractions of Bangkok, including its magnificent Grand Palace. Not far from Bangkok, you can also explore the attractions of Ayutthaya, Thailand's former capital. Sun, Sand, and Sea: If you're looking for a beach fix, see our article on the popular tourist sites of Pattaya, just a short hop from Kanchanaburi, and things to see and do on Phuket Island, farther south. Northeast of Phuket, the city of Surat Thani is the gateway to the famous beach destinations of Koh Samui, Koh Phangan, and Koh Tao. Khao Yai National Park: Immerse yourself in Thailand's natural beauty at mountainous Khao Yai National Park, about 300 kilometers east of Kanchanaburi. Explore jungle waterfalls and lakes, and see an astounding diversity of wildlife, including elephants, black bears, clouded leopards, and king cobras.